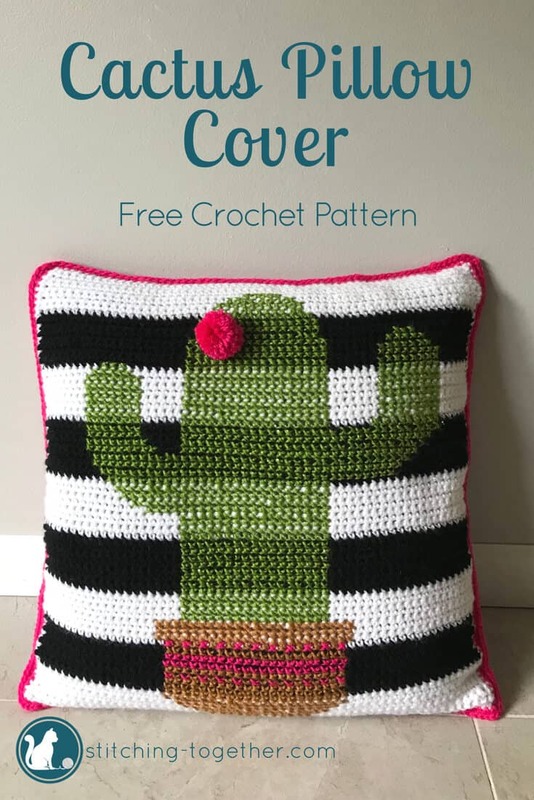 Keep scrolling to view the free crochet cactus pillow pattern. Skills to know include single crochet and cross stitch. Don’t forget to Pin it for later! We have a serious problem. I’ll just come right out and say it: Succulents are luring us into a false sense of security. And I get it! They are adorable, but we’ve opened our arms wide to them and have somehow begun to embrace the good old regular cactus in our love for small hardy plants. 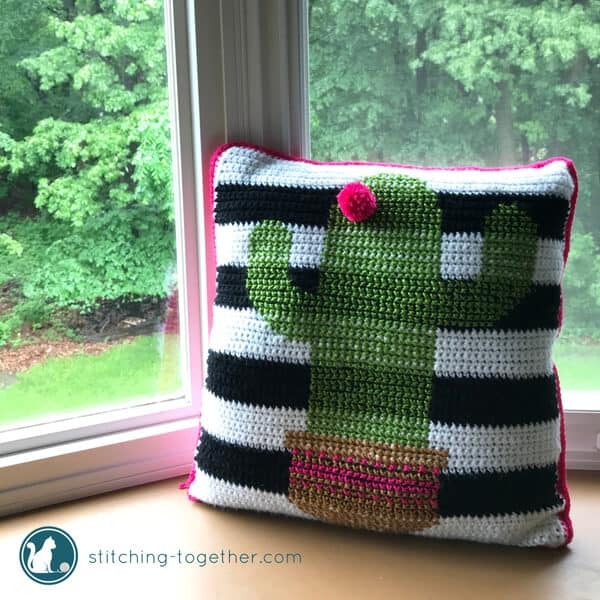 Have you noticed that cute and cuddly cacti motifs are EVERYWHERE right now? When a cactus blooms it can actually be incredibly lovely, from a safe distance BUT I still find it funny that we are decorating our homes with images of a plant that’s really designed to cause extreme pain. I guess we can call this design my version of “when life gives you lemons…”: “when trends give you cacti, make them cute and sparkly“. I can’t remember who gave me the idea to cross stitch on crochet, it was either Jess at Make and Do Crew or Brittany at Bhooked Crochet (check them both out, they are AMAZING!). I started cross stitching before crocheting and it has always been one of my favorite crafts. It was so fun to work on a project that incorporated two of my favorites! 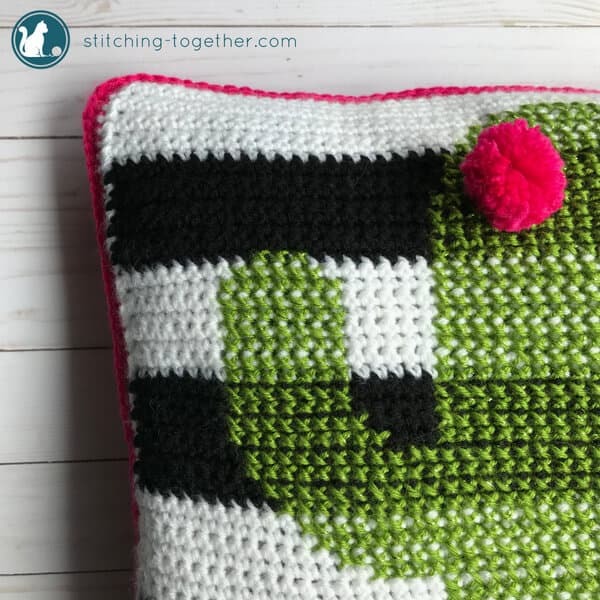 The single crochets of the pillow cover are perfect for using as a cross stitch fabric. Each stitch is relatively squarish and has 4 holes. I used a large eye tapestry needle to cross stitch and used the entire strand of yarn. 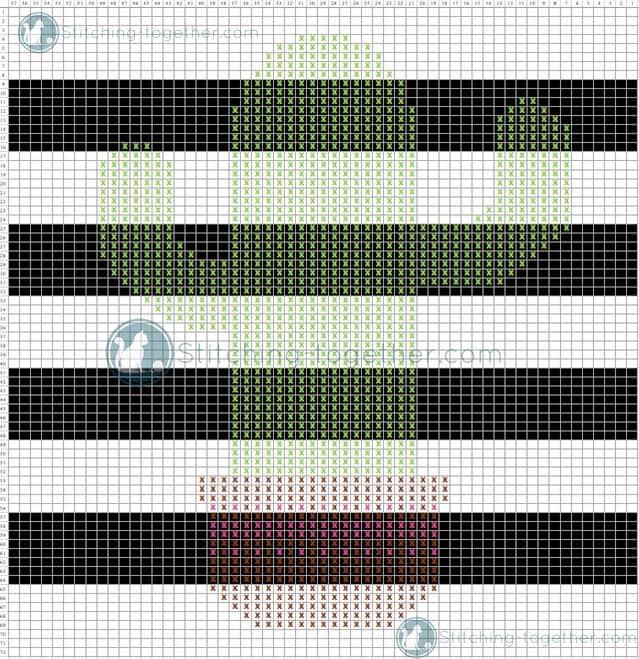 Before adding the cross stitch pattern, the front side is just a square of black and white stripes. 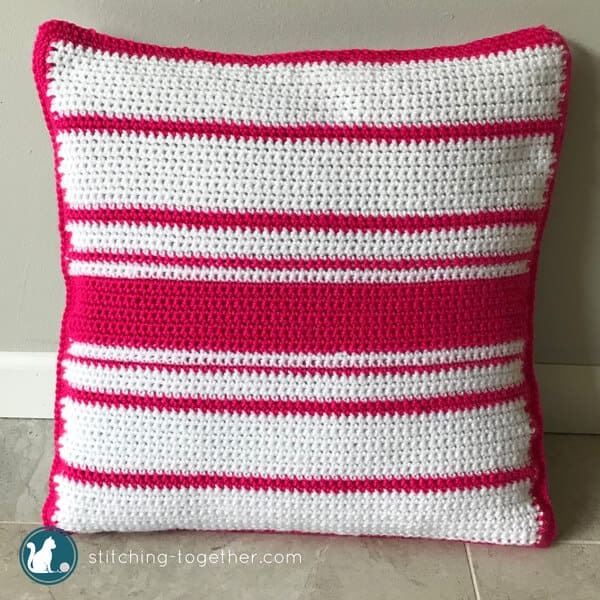 The back side of the pillow has a simple striping pattern all in single crochets. It may look like a complicated project but it is rather easy! Spend less time shopping and more time crafting! The links below lead to Amazon and are there for your convenience at no cost to you. The crochet part of the front panel is completed before adding the cross stitch pattern. 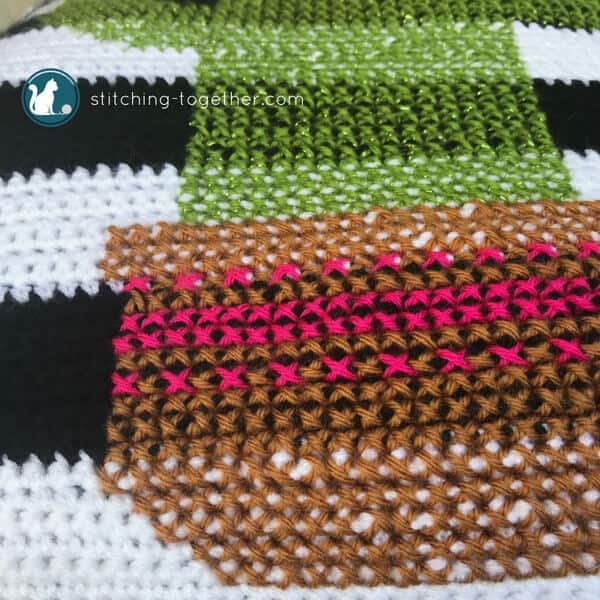 Each single crochet has a hole at all four corners allowing you to cross stitch over the single crochet. The finished size of the panels is a bit smaller than the pillow form but this allows it to fit snugly around the pillow. R2-72: ch 1, sc in each st, alternating colors between black and white every 8 rows. Round 1: Using white, ch 1, sc around the entire outer edge of the front panel, join with sl st to first sc of round. Round 2: Using bright pink, ch 1, sc around, join with sl st to first sc of round. Follow the cross stitch pattern shown on the graph. Each square represents one single crochet. Add bright pink pom pom to the cactus. R63-72: Using White, ch 1, sc in each st, turn. 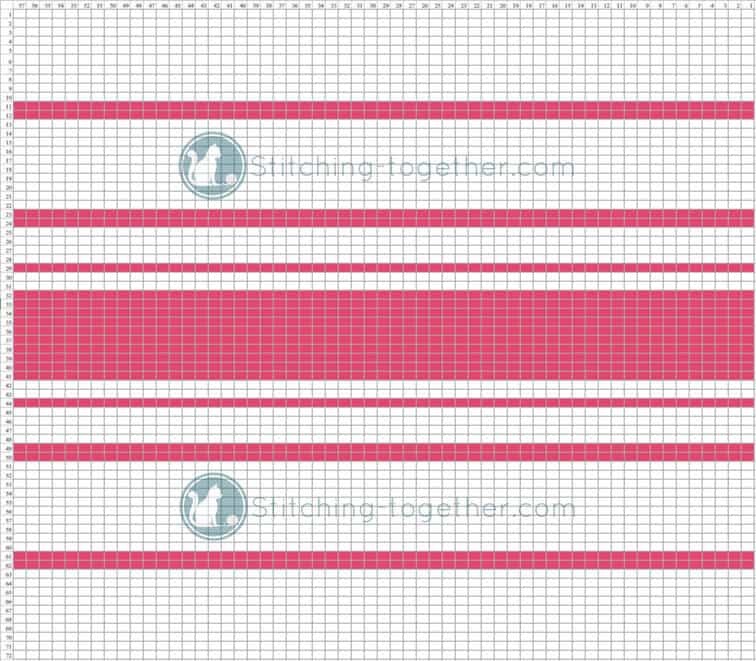 Round 1-2: Using bright pink, ch 1, sc around the entire outer edge of the back panel, join with sl st to first sc of round. Hold the front panel and back panel together with the cactus side facing out. (The back panel is reversible.) Using bright pink, sc the two panels together inserting the pillow form once 3 of the sides are joined. Weave in ends. 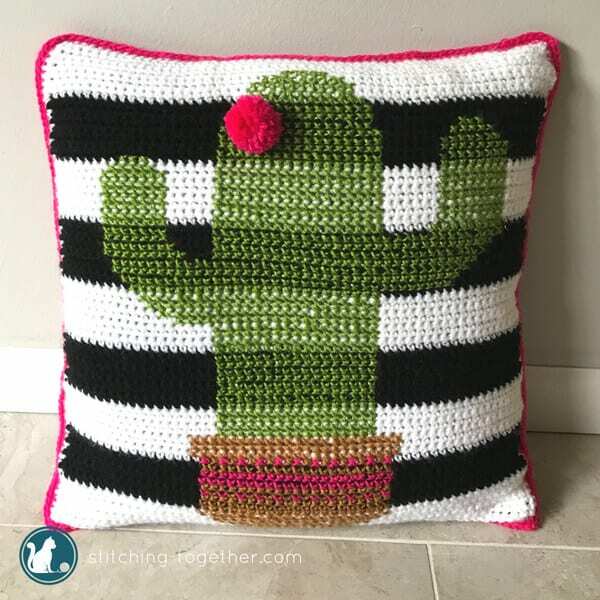 If you use this Crochet Cactus Pillow pattern I’d love to see your finished work! Tag me on social and use #stitchingtog to show off your makes! How cute!! 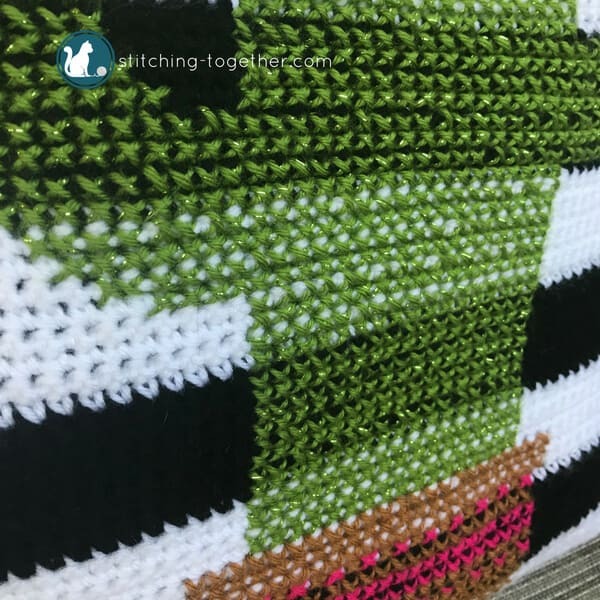 I never thought to cross stitch on crochet, but it looks wonderful. Thanks for sharing the pattern. I would love to use this in a “summer projects” roundup and link back to you, if that’s okay? Hi there! I just learned about your site from HOHD! I love this pillow. That was so clever how you stitched over the background design. I love learning new techniques! Thank you for sharing. I just added your blog to my blog reader so I’m looking forward to seeing what else you come up with! Thanks for the kind words Mary Beth!